This beautiful bank in East St. Louis, IL suffered water damage due to leaky pipes. 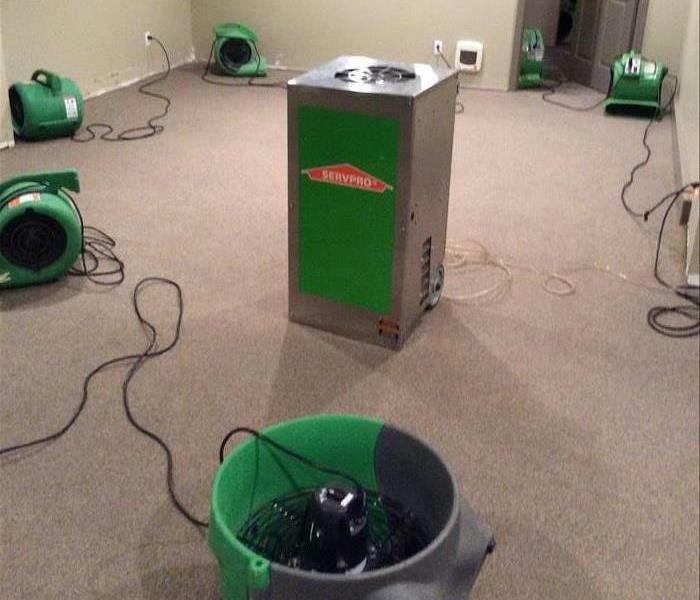 Our SERVPRO technicians made quick work of it using dehumidifiers, air movers, and cleaning chemicals. When you use SERVPRO, know that we care about YOU. Restoring your building back to pre-disaster condition is our top priority to make it “Like it never even happened”. 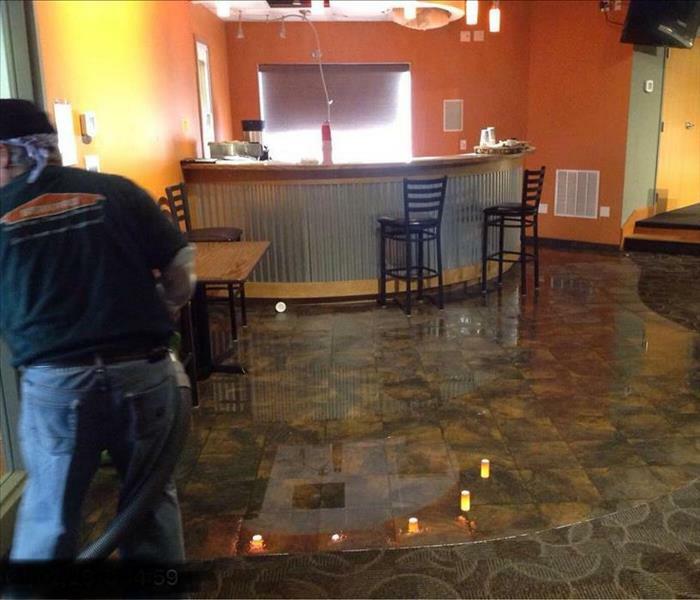 If your business suffers water damage, call your local experts, SERVPRO of Monroe, Randolph & Washington Counties at (618) 464-0300. If you have a fire, water, storm, or mold disaster in YOUR home or business, call your local SERVPRO of Monroe, Randolph & Washington Counties at (618) 464-0300. We at SERVPRO of Monroe, Randolph & Washington Counties hold all of our employees to a high standard. In order to rid your home or business of fire, water, storm, or mold damage quickly and efficiently, our employees know the insides and out of all of our processes and equipment. 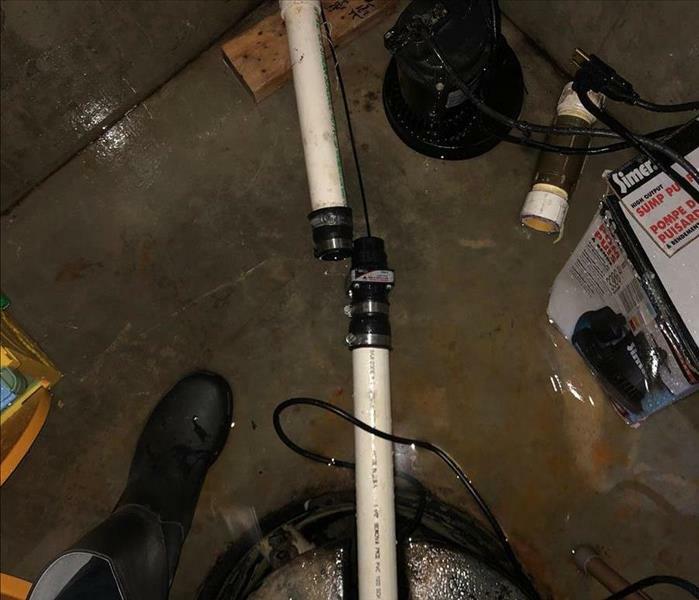 Our very own sales representative, Ben Rohan, is pictured with boots on, assisting with documenting the improperly-installed sump pump in this Columbia, IL basement. We at SERVPRO know the meaning of hard work and will not stop until the damage is “Like it never even happened." If your home or business is afflicted by water, fire, storm, or mold damage, call the experts at (618) 464-0300. 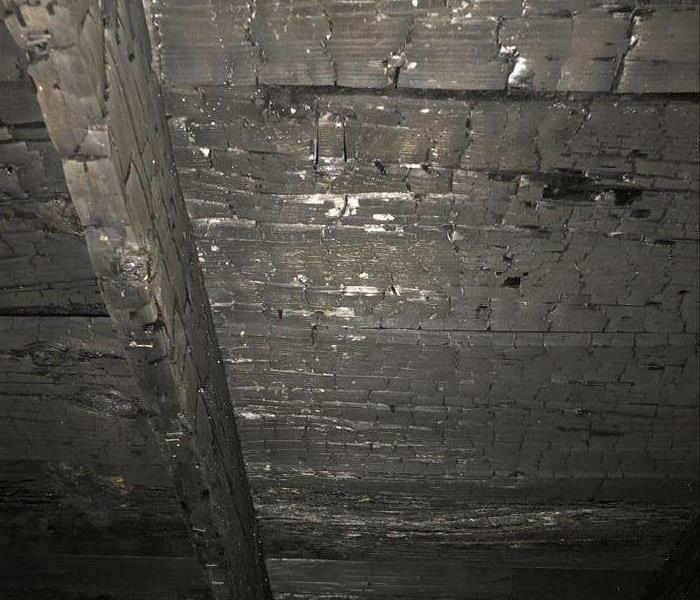 The ceiling of this Chester, IL home was charred to a crisp when a fire started in the basement. Luckily, they called SERVPRO of Monroe, Randolph & Washington Counties and we were able to rid the basement of debris the fire left behind. The job was finished swiftly and efficiently to allow construction to happen as quickly as possible. If YOUR home or business has fire damage, call the SERVPRO of Monroe, Randolph & Washington Counties 24/7 at (618) 464-0300. 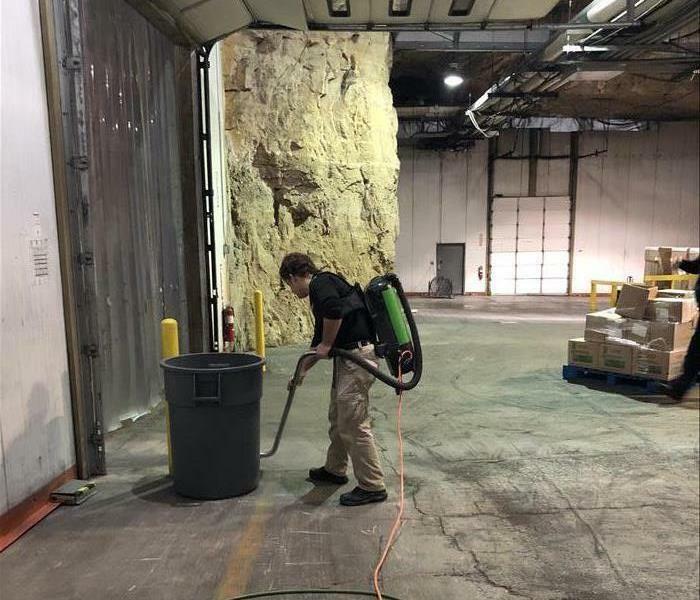 The Blue Line Food Service Located in Rock City Admiral Parkway Development, that is, a distribution company within a cave, needs cleaning about once every year. So, in order to meet their needs, SERVPRO of Monroe, Randolph & Washington Counties goes spelunking! We vacuum and clean their warehouses with the efficiency that only SERVPRO has. If your business needs general cleaning of any kind, call SERVPRO 24/7 at (618) 464-0300. 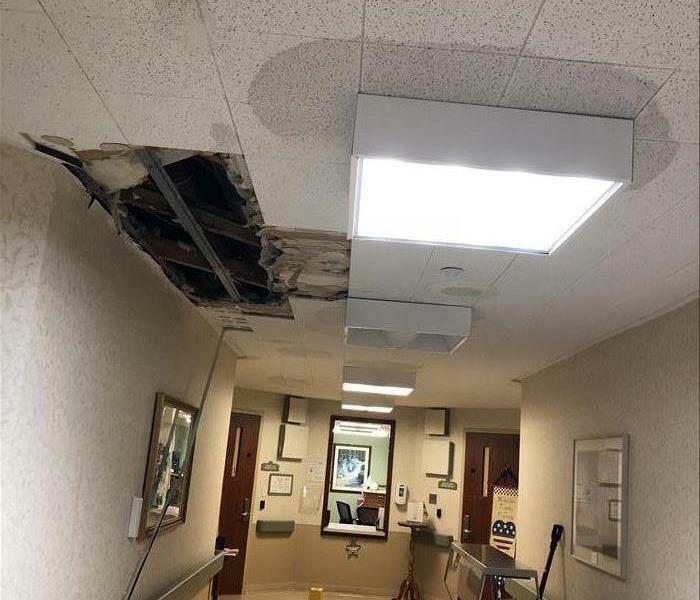 This nursing home suffered water damage after a pipe in the ceiling burst, dripping water on the ceiling tiles. 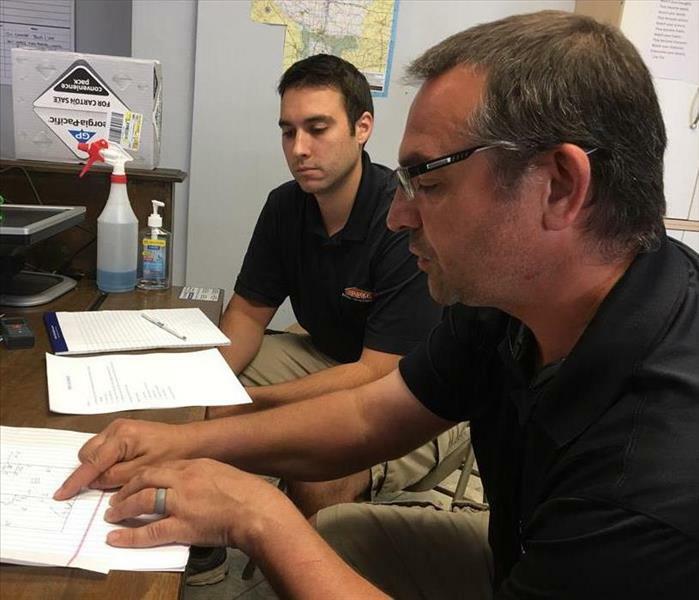 We at SERVPRO know how important your business is, so we take any water issues very seriously. Our technicians quickly cleaned all damaged areas around the burst, creating as little impact on the nursing home’s day-to-day activities as possible. If your building suffers any water or storm damages, call the experts at SERVPRO. We are faster to any size disaster so you can get back to business. 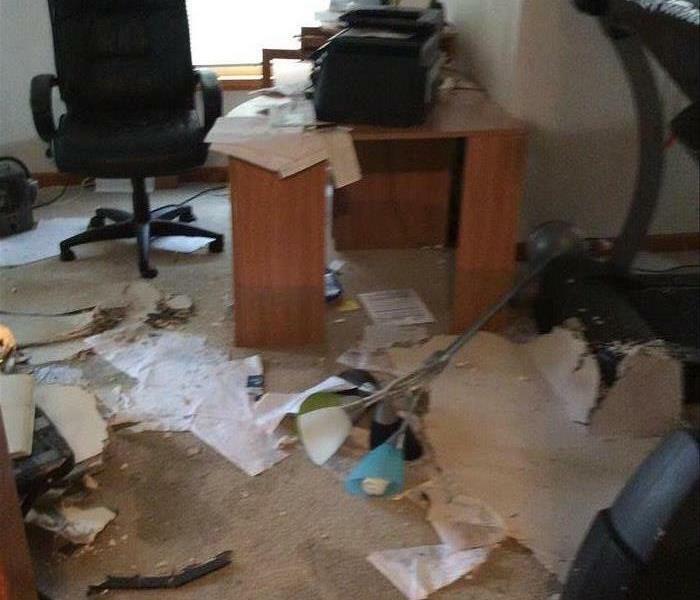 This Sparta, IL home suffered water damage in one of the bathrooms, causing the basement office ceiling to collapse. The owner was away for a couple of days, which is why the water was allowed to damage as much as it did. Make sure your home stays cave-in-free by calling your local SERVPRO of Monroe, Randolph & Washington Counties as soon as you see signs of water damage. Contact us 24/7 at (618) 464-0300. Because your home or business looks great in SERVPRO green! When you see your building filled with our green air movers, air scrubbers, dehumidifiers, pumps, extraction units, hydroxyl generators, and more, know that you are receiving quick and thorough restoration. Our highly-trained technicians know their equipment inside and out in order to make any disaster “Like it never even happened." SERVPRO was called to this Byrnes Mill, MO home after a stove fire wreaked havoc throughout the kitchen and the rest of the home. Luckily, no one was injured, but the damage was still great. SERVPRO of Monroe, Randolph & Washington Counties was able to clean all affected areas, vacuum all of the soot webs, and have the stove replaced. We know how stressful fire disasters can be, so leave everything to the recovery experts. If your home or business suffers from fire damage, call us 24/7 at (618) 464-0300. Storms can be tricky. They may cause huge amounts of damage from falling debris or flooding water, or they can seemingly do nothing at all. Sometimes, it can look as if a heavy storm has spared you, but in reality is slowly destroying your home with a small amount of water damage that can quickly lead to a myriad of other issues. When this Millstadt, IL basement was afflicted by the storm, that minuscule amount of water seeped into the base of the walls, slowly ruining the wood and soaking into other surfaces. Our technicians were able to remove the problem areas and dry all of the excess water. 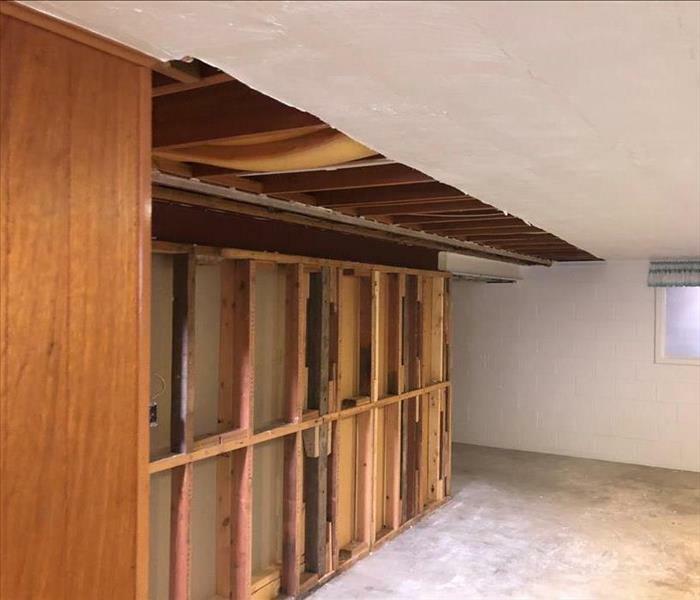 By acting quickly, we made sure the basement did not have secondary damages. If your home or business has a storm or water issue, do not hesitate to call your local SERVPRO of Monroe, Randolph & Washington Counties at (618) 464-0300. 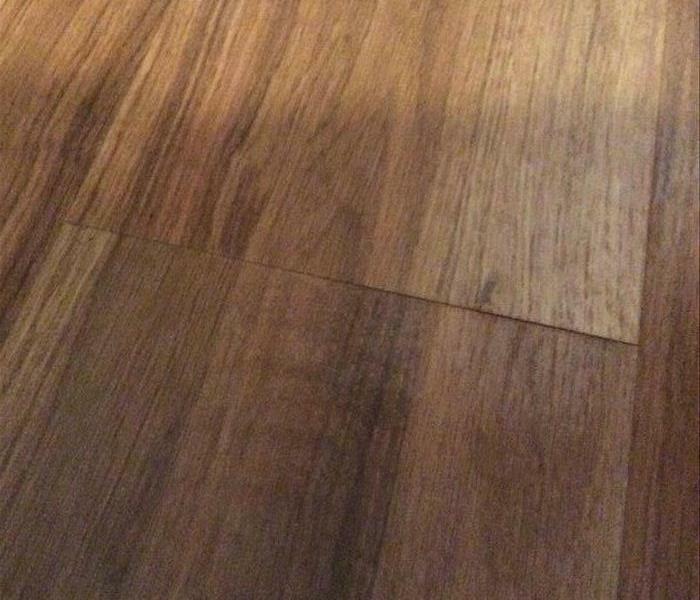 If your home or business has hardwood flooring, always be wary of the signs they show of water damage. The boards will usually be stained and raised at the seams due to swelling and warping. If your hardwood floors are suffering from water damage, call SERVPRO of Monroe, Randolph & Washington Counties and our highly-trained technicians will make it “Like it never even happened." Call us 24/7 at (618) 464-0300. If your home or business has storm damage, call your local SERVPRO of Monroe, Randolph & Washington Counties at (618) 464-0300. A Red Bud, IL basement recently had parts of its drywall taken out due to heavy mold. The area required an air mover to dry up the water that the mold was living on as well as negative pressure in the room to rid it of spores. Negative pressure is when we seal off the room to force the air into an air scrubber, which cleans the air of spores and sends it elsewhere. If you need mold remediated in your home, call your local mold experts, SERVPRO of Monroe, Randolph & Washington Counties, at (618) 464-0300. Here at SERVPRO, we go to any length to recover your home from any disaster. 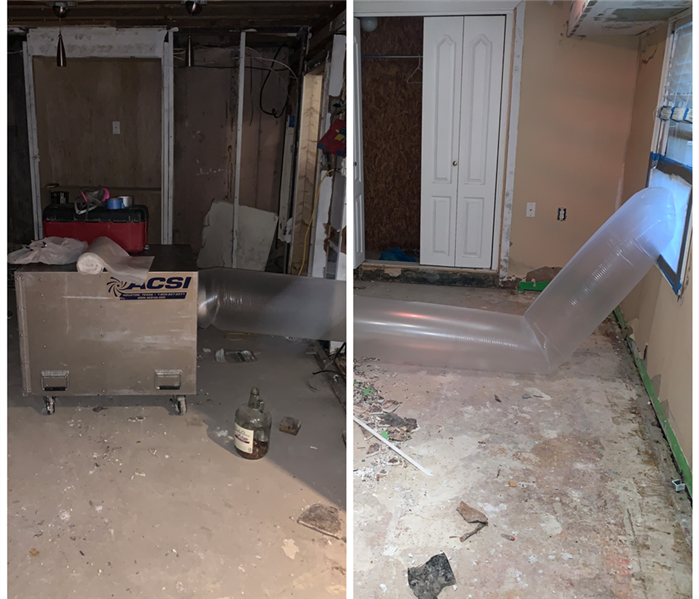 In this Columbia, IL basement, our technicians had to flow filtered air through two rooms to hook up to the only window in order to remediate their mold issue. If your home is in need of mold remediation, do not hesitate to call the experts 24/7 at (618) 464-0300. See a few "harmless" white spots around your basement? It must just be some dust from a project or some residue leftover when your home was built, right? Unfortunately, they can actually be surface molds spreading spores in your home! These kinds of surface molds can take many forms, including seemingly neutral white spots. If you see any spots in your home that do not seem like they belong, call the experts: us! This is what can happen to a home when mold is left unchecked. This New Athens, IL home experienced heavy mold in their basement staircase. 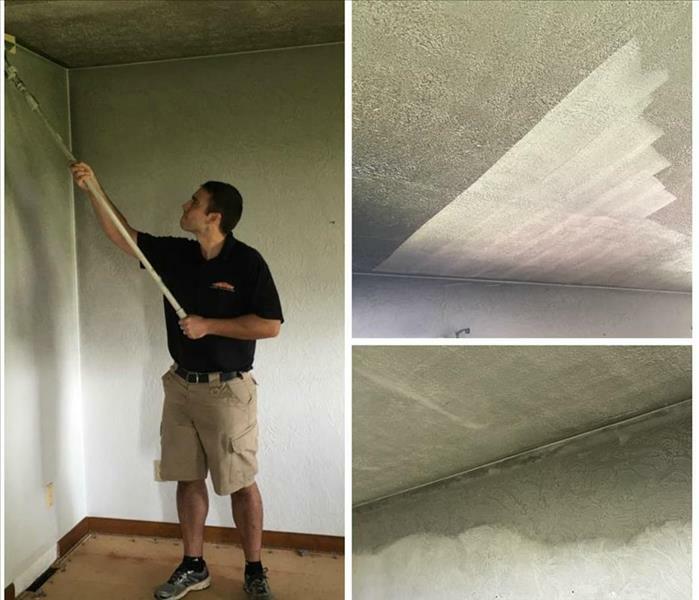 Our SERVPRO technicians were able to remove all affected drywall and remediate, or bring back to natural levels, all of the mold in the basement. At that point, the drywall was replaced, and the homeowner's staircase was restored. 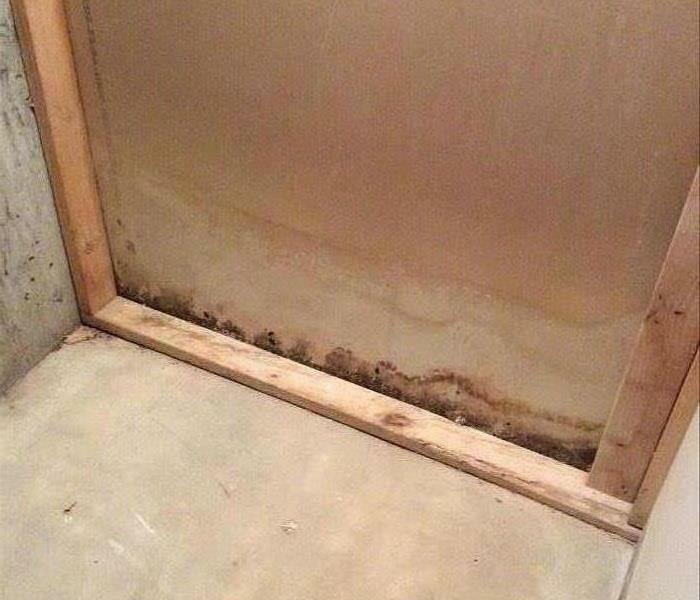 A large amount of mold found behind the drywall of a Waterloo, IL home. 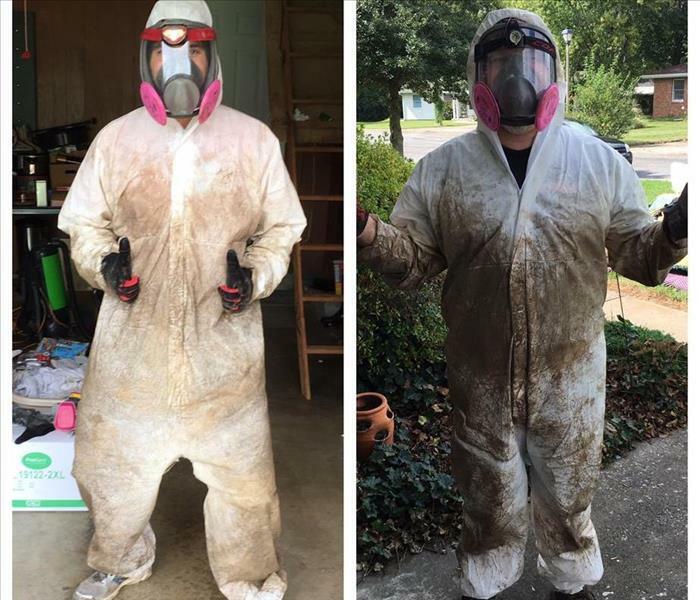 As soon as the client called, we had our technicians on site, suited up for the job. They swiftly rooted out the mold and remediated it, as only SERVPRO technicians do so well. 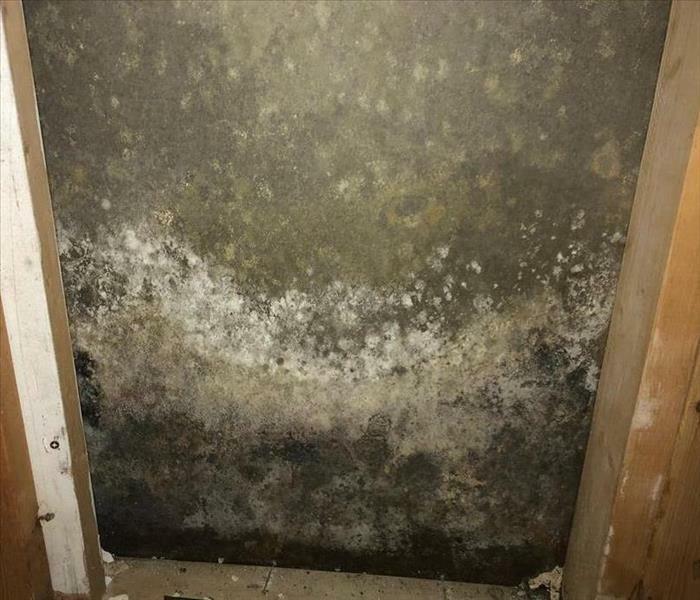 If you find yourself seeing or smelling any amount of mold in your home, call us at 618-464-0300 and we will make it "Like it never even happened." 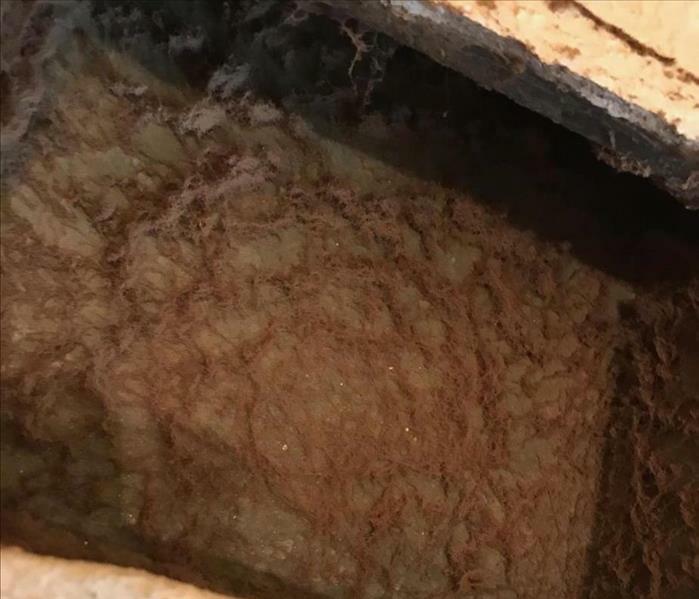 Sometimes storms can cause sewers to backup into you home. Raw sewage is also known as Category 3 water, which is grossly contaminated and can contain pathogenic, toxigenic, or other harmful agents. Do not try to clean this up yourself, call SERVPRO of Monroe, Randolph & Washington Counties at 618-464-0300 and we can help make it "Like it never even happened." At SERVPRO of Monroe, Randolph & Washington Counties, our goal is to restore as opposed to replace. We have specialty drying equipment to minimize demolition to your home or business. Call 618-464-0300 for a free estimate! Storm water is not the type of water you want in your home! 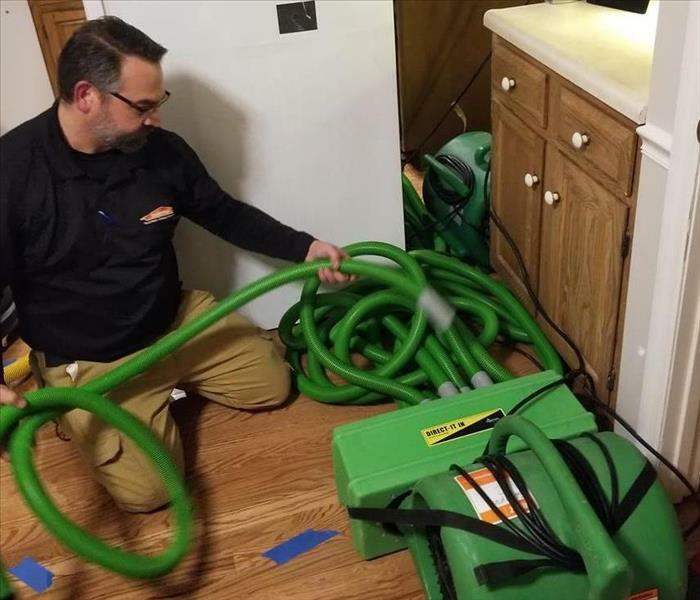 With a little help from the neighbors, SERVPRO of Monroe, Randolph & Washington Counties was able to help this family clean up storm water out of their basement when they were out of town. Why SERVPRO? Because SERVPRO of Monroe, Randolph & Washington Counties believes in not only restoring structures, but restoring lives. This family had irreplaceable memories of their kid's heights throughout the years. After they experienced a fire damage to their home we were able to restore these memories to them! Keep an eye on your properties between vacancies. This home in Red Bud IL was vacant for just a week. Water flowed out of a broke dishwasher line for a significant amount of time causing it to flow outside and freezing. Thus creating frozen waterfalls. but footprints on your carpet is not beautiful. 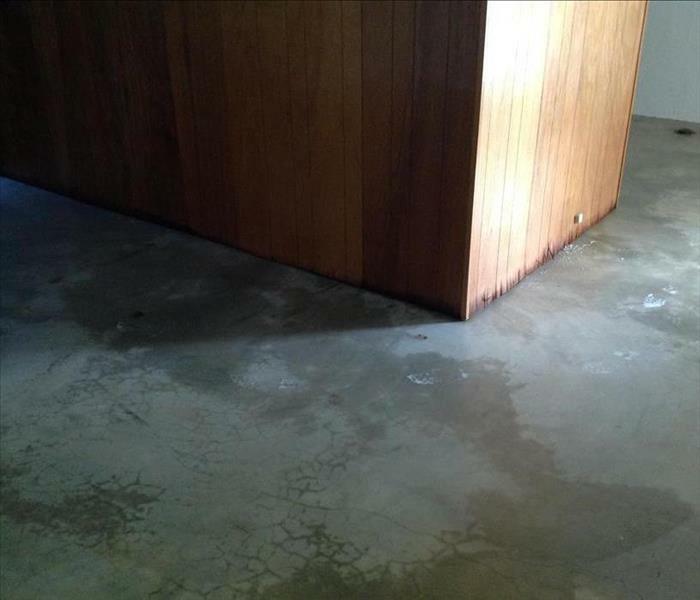 This home in Waterloo, IL had soaking wet carpets due to a water line break from the dishwasher. 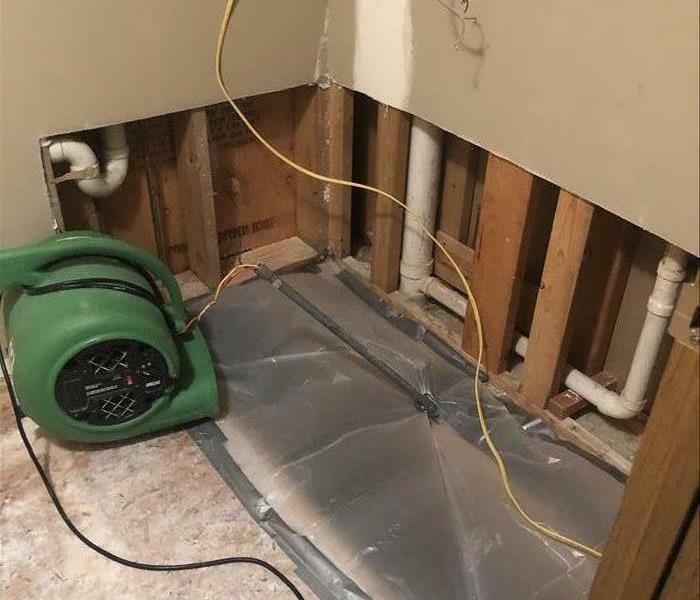 We at SERVPRO of Monroe, Randolph & Washington Counties were able to extract the water out of the carpets and make it "Like it never even happened." When water comes from above it is a blessing, however when it's in your home...it's not. This customer in Waterloo IL called SERVPRO of Monroe, Randolph & Washington Counties and we helped make it "Like it never even happened." Why SERVPRO? This is the aftermath of a kitchen fire in Chester IL. Our first question is, "is everyone OK?" Why SERVPRO? Because we care for people and structures! This basement is in desperate need of water extraction. You can use a shop vac or you can call SERVPRO of Monroe, Randolph & Washington Counties and we can help make it "Like it never even happened." Storm damage in your Nashville, IL home. When the storm outside comes inside your home and you don't know what to do, just call SERVPRO of Monroe, Randolph & Washington Counties. We can help you return to normal after the storm. Standing water inside your home is no fun, unless you love swimming. When a storm hits you, call SERVPRO of Monroe, Randolph & Washington Counties at 618-464-0300. We can help make it "Like it never even happened." When you experience a fire damage in your home and you have vaulted ceilings, you should call SERVPRO of Monroe, Randolph & Washington Counties. We specialize in fire and smoke restoration. 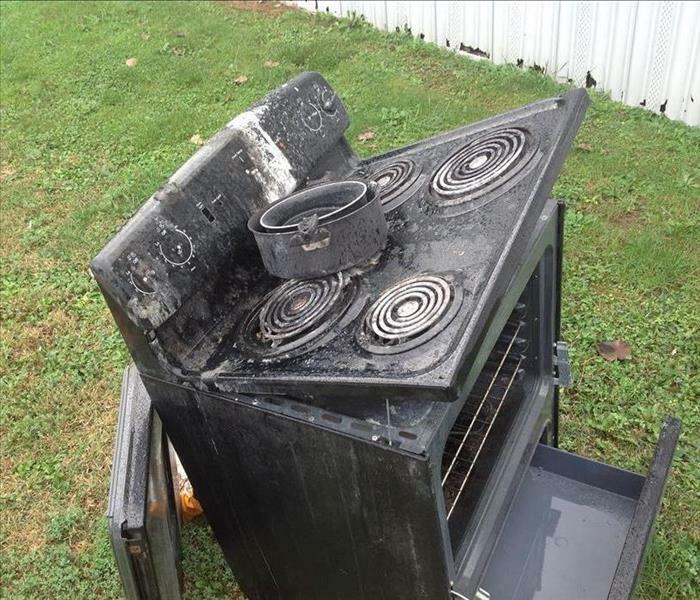 It is never a happy moment to see a burned up stove outside in someones front yard. However SERVPRO of Monroe, Randolph & Washington Counties is ready to help make that fire loss "Like it never even happened." Don't fall asleep...in the bathtub! The Holiday Inn Express in Sparta, IL knew who to call if they ever experienced a disaster. A few years after providing an Emergency Ready Profile, E.R.P. for this building, Kevin called SERVPRO of Monroe, Randolph & Washington Counties to help clean and dry after a tenant fell asleep in a bathtub with the water running. We are ready to restore your commercial structure's damage 24 hours a day/7 days a week. Water damage at a local high school band room. Okawville IL. Young musicians need a place to practice! The superintendent of Okawville called us for help due to a pipe break in the utility room at the high school. The water spread all the way into the band room thus ending the morning band class. SERVPRO of Monroe, Randolph & Washington Counties came to the rescue by cleaning and drying out all the affected areas. The band and instructor were thrilled to get back into the groove! This is just the outside of the water loss at a commercial building in Steeleville, IL. The use of a desiccant dehumidifier was needed for this large space. SERVPRO of Monroe, Randolph & Washington Counties was able to help get these people back in business. This is just some of the aftermath of a garage fire, in a tiny little farming town. There was significant damage though out the whole house. This house has been in the family for over 80 years, they were very impressed with how quickly we were there to help them get moving in the Fire demo process. We make disasters "Like it never even happened." Have you had your air ducts cleaned? This is a picture of an air duct in Marissa, IL before the cleaning! The owner had just purchased this home and couldn't believe how bad it was! Crawling through your Columbia IL crawl space. Here are some crew members, after they crawled out of a moldy crawl space! The home owner was very thankful that the guys would go down there and clean it "Like it never even happened." Here is a picture of Aaron Drake, Owner & Mike Gorton, Crew Chief doing some on sight team Training. Aaron, even though he's the owner gets right in there and trains the guys from his own experience. Check it out, this is Mike Gorton, Crew Chief doing some wall and ceiling clean up on a small smoke damage home! We make disasters "Like it never even happened."